"Kindness is no virtue... and cruelty is no vice." Despair and isolation are all that remain in his wake. Believes the poor should be exploited, the weak oppressed, and the noble corrupted. Others' pain is his sole pleasure. In scorpion mode, tail shoots 100,000 volt electric bursts, has twin pulse blasters, claws can crush mountains. In defense base mode, has over-the-horizon radar, communications center, anti-aircraft sonic cannon, repair bay, construction bay; semi-autonomous armored interceptor with dual photon cannons that patrol the base perimeter. In robot mode, has fusion-powered anti-gravity gin. Binary-bonded to Lord Zarak, leader of the evil Nebulans. "Just one look from me and you've lost." A mystic; spends most of his time trying to contact the electromagnetic essences of long-dead Decepticons than talking to live ones. Binary-bonded to Vorath, former Nebulan Minister of Science, expelled from office as a result of an illegal experiments scandal. In bat mode, has hypnotic stare, flies at 700mph. In robot mode, uses vipor pistol -- shoots streams of neuro-circuitry paralyzing liquid. "My pleasure with my enemy's pain comes." Cruel, vicious, but apparently built with a few wires crossed. Talks to himself in a song-song backward way: "Destroy the Autobots I shall. Tear them to scrap I will." Binary-bonded to Monzo, a brutish, professional hyperwrestler- turned underworld nightclub owner. In robot mode, uses photon pistol and thermal sword. In wolf mode, nose module is equipped with various tracking scanners. Can leap .8 miles. "Autobots are like bad fuel -- weak and greasy." Has a habit of grinding his teeth before he strikes -- annoying his friends and tipping off his enemies. Binary-bonded to Grax, a Nebulan industrialist who's joined up to eliminate his competition. 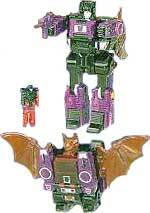 In robot mode, uses softening ray run -- gives metal the consistency of rubber, making his enemies easier to chew when he reverts to alligator mode.